During his first live TV interview from space, the British astronaut explains some of the "exciting" research being carried out. British astronaut Tim Peake has suggested that setting up a "Moon colony" could be the next logical step for space research. 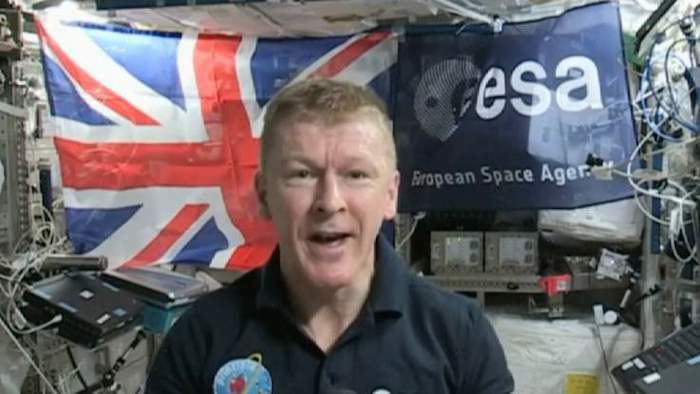 In his first live television interview since blasting off from Earth, Major Peake answered questions submitted by Sky News viewers. When asked about the possibility of establishing a permanent base on the Moon, Major Peake suggested it was a "great ambition" because it could be used to learn more about travelling to Mars. "It enables us to investigate many of the challenges we're going to face in terms of radiation exposure, (and) energy production," he said. "However the Moon in itself is a wonderful place to set up a location for research. "There's a huge amount that we've still yet to discover about the Moon. It call tell us a lot of things about the origins of our own planet. "I hope that we see that as a next destination in itself, and also as a stepping stone to Mars in the future." He says astronauts on board the International Space Station (ISS) are working 12 to 14 hour days to carry out more than 250 experiments. "I think personally the medical experiments are some of the most exciting and interesting ones that have the potential to benefit people back on planet Earth the most," he said. Some of that research is looking at how the ageing process affects bone density and muscle loss. It is also investigating why viruses are more virulent in a micro-gravity environment. The interview was broadcast live from the ISS, where Major Peake will spend a total of six months before returning to Earth. But he has told Sky News that he hopes to return again one day. "I certainly hope there are a few more flights to come," he said. "It certainly is very addictive. It's great to be up here - it's a wonderful experience." Having said that, he does admit to missing some things while he's away from Earth. "It is the fresh air and being outdoors, but also the colour green. We don't have the colour green on the Space Station." Major Peake joined the European Space Agency in 2009 after retiring as a helicopter test pilot in the British Army. :: The full Tim Peake interview will be rebroadcast on Sky News at 9:30pm UK time.